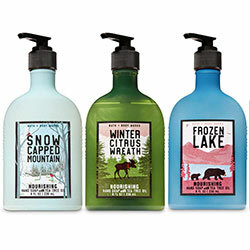 Outdoor Scents by Bath & Body Works - A new fragrance collection of hand soap inspired by the scents of the Great Outdoors. This new soap collection is enriched with tea tree oil to nourishing your hands with every wash. The crisp scent collection includes the new scents of Frozen Lake (cypress, eucalyptus, juniper berry), Snow Capped Mountain (fig, sandalwood, mountain air), and Winter Citrus Wreath (balsam, citrus, forest breeze), along with seasonal favorites of Toasted Vanilla Chai (vanilla, sugar, winter spice), and Frosted Cranberry (cranberry, apple, woods). Available in gentle foaming hand soap, hand soap with tea tree oil, and gentle exfoliating hand soap from Bath & Body Works stores.